Nègre's reputation as a photographer rests on his genre pictures of Paris street life and on his landscape and architectural views of the Midi. Trained as a painter in the Paris studio of Paul Delaroche, he looked to his contemporaries for inspiration as he created authentic views of the rural world near his birthplace, Grasse, in southern France. This photograph recalls similar subjects by Jean François Millet, a Barbizon artist who depicted country life realistically in his paintings and graphic work. 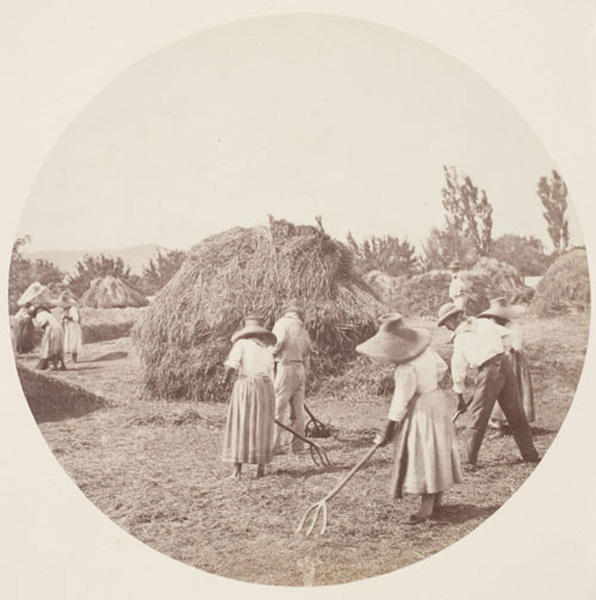 Cropped from a rectangular negative, the picture's circular format unifies foreground and background- the workers in the field with haystacks, the poplar trees, and the distant landscape.